Everyone has their favourites when it comes to restaurants. But there are those undisputed kings at the top of their game and Bangalore has her fair share (thank goodness) of restaurants that will take you from the roaring 1920s to present times with the first rava idli, straight-from-America burgers and even authentic Sunday Roast, a legacy courtesy the Brits. Luckily for you, we know of ten of the most iconic. But if you’re a true-blue Bangalorean who knows more, then we’re happy to add on those pieces of history to this list. If you haven’t been to MTR (Mavalli Tiffin Rooms) then you are really missing out on being part of history. And of course on the legendary masala dosa. Quaint, double-storeyed, and packed to the point of people queuing on the street, a trip here must also include a Rava Idli (apparently they created it during WWII when rice to make idlis was scarce, so they experimented with semolina) – the best in the world, we say! You may remember it as a burger kiosk beside Rex theatre, or a dining space in Mota Arcade. Or perhaps you’ve heard of it as currently dominating Museum Road’s diners. But heard of The Only Place you have! Started by the late Haroon Sait to bring a slice of quintessential America to Bangalore (chequered tablecloth and all), the burgers have a stand-off with steaks for most delicious, while the apple pie has been reigning queen since the 60s. A legacy running successfully since 1930, your grandparents probably had their first date here over the then exotic strawberry ice cream. Owned originally by Englishman James Meadow Charles, it was sold (incidentally, in 1947!) to Indian Vraj Lal. Then came more than just ice cream. Despite a few ups and downs, the loyalists followed it around, ending up at its current addresses in Indiranagar and the original MG Road spot. Pizzas, ‘sand witches’ and milkshakes should be on your priority list. For nostalgia if nothing else. An absolute Bangalore establishment, Koshy’s technically comprises Jewel Box, Parade Café and Koshy’s Bakery all in the same building. If you lived in times gone by, you may have bumped into Queen Elizabeth II or even Jawarharlal Nehru here. Now though, the artsy sort gather here for filter coffee and Prawn Biryani in the evening. For breakfast, bread-butter-jam with a side order of eggs (made to order), bacon and sausages is a staple. Or head here for an English Sunday lunch of roast chicken, gravy, stuffing and potato. Then lurk around for some coffee. And then some more. Until you need pakodas and a sandwich! Oh don’t we love our ‘tiffin’ and coffee. Home to writers, artists and poets in the 40s, and hungry townsfolk in current times. Bangaloreans will not think twice to traverse the lengths of the city for a plate of hot bene dose (bene = butter, copious amounts of butter) and a glass of piping hot unadulterated filter coffee after. Early morning breakfast here means waiting for a bit, but it is all worth it in the end. Old-world charm is maintained at this hotspot. It’s common courtesy to eat and take the coffee outside to make room for others. Word of advice: have a chat with some of the senior citizens while here. They’ll open your eyes to the Bangalore of the past. No really, it is said to be the oldest establishment for brekkie. Long before the fancy five-stars and their Norwegian salmon, Unicorn was really like a mythical place for seafood lovers! Never mind the slightly worn out sofas and frayed tablecloths. Especially when you have Chilli Crab, Prawn Masala, Chicken Ghee Roast and fluffy appams before you. Add to that the fact that it’s only fresh catch (they won’t serve it if it’s been in the freezer for long), throw-away prices and you’ve got yourself Christmas early anytime you go here. Oh how Airlines broke our hearts when they shut shop temporarily. But mercifully they reopened and fans flocked for their fill of ‘Airlines One-By-Two’ coffee, ‘masaldosa’ and then topped it off with hot Jalebis and Kesari Bhath. Then just keep chatting under the trees with the birds for company until someone from service throws your bill on the table, signifying your time out. If you’re smart, like most regulars are, you’ll quickly order sweet lime juice and channa bhatura (fluffy and divine) to buy more time. Or use their drive-in option. Set in the Centenary Building on MG Road, this legendary North Indian restaurant is perhaps the pioneer of the cuisine in Bangalore. Paneer, any kind, but especially the tikka is divine, and the kebabs, be it lamb or chicken, are soft, flavourful and succulent. Dal Makhani is what the place is famous for, and is to be paired with tandoori roti. That said, it hasn’t kept up décor very much, and the pricing does seem a bit high. Still, we’ll go there. Again. 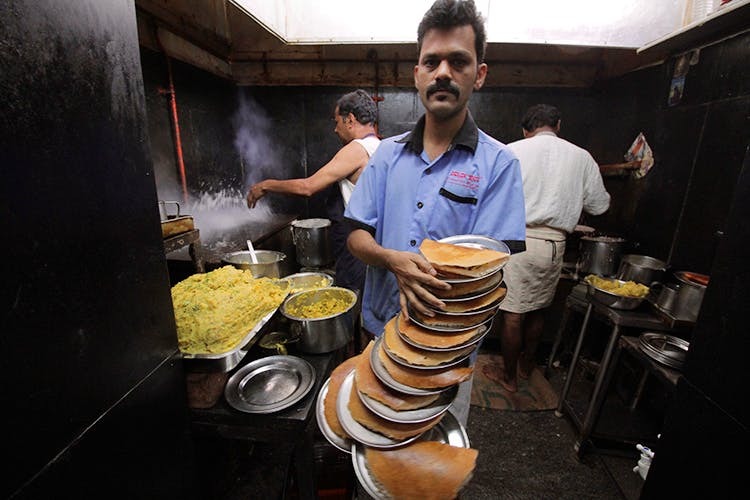 Bringing you outstanding Masala Dosa, Khara Bhath, Kesari Bhath and filter coffee since 1943, there’s little about Vidhyarthi Bhavan that isn’t typical old Bangalore. Times and things may have changed around it, but this no-frills establishment keeps things as simple as always. Well, the amount of ghee they put might have increased further. But who’s complaining, eh?